The staff at Pakta, the Adrià brothers’ new Barcelona restaurant, tell writer Michael Idov where to find the city’s best food. No one knows a city’s dining scene better than the people who work at its very best restaurants. With that in mind, FOOD & WINE sent me to the most exciting place in Barcelona, Pakta, and instructed me to pester the staff for enough restaurant recommendations to last the rest of my weekend. Of the five places that the brothers Ferran and Albert Adrià opened in Barcelona after shuttering their legendary El Bulli, Pakta is the least expected. 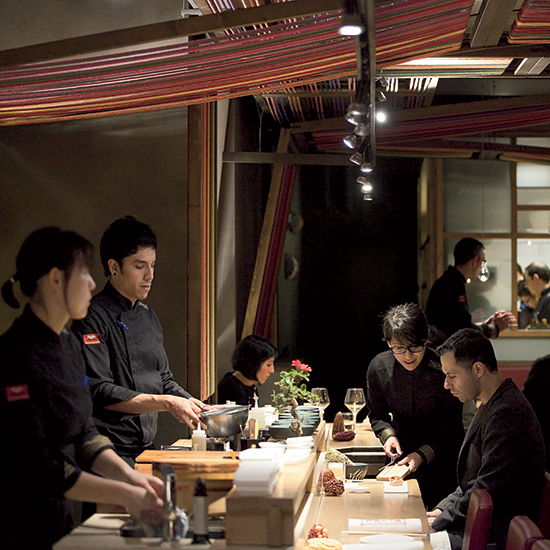 For one thing, it serves Nikkei cuisine, a Japanese-Peruvian hybrid with century-old origins in Peru. Pakta is perfect for my purposes: I know the tips I get here will, at the very least, be diverse. Diversity, after all, is baked right into the idea of the place. It employs two head chefs (Kyoko Ii from Japan, and Jorge Muñoz from Peru) and serves dueling “Fujiyama” and “Machu-Picchu” tasting menus. My reservation is for 7 p.m., right as Pakta opens for business. The dining room is small, seating only 34, and would look like a classic blond-wood Japanese restaurant were it not for its ceiling, hung with ropes of Peruvian yarn. As I walk in, the waitstaff is still receiving the last of the night’s instruction. Ii is prepping appetizers in an enclosure that would, in a Japanese restaurant, be the sushi counter. I sit there, the better to watch her work. My first conversation is with the headwaiter, named Zetkin Lian Chung; her favorite place in Barcelona is a cocktail joint named Ohla Boutique Bar. Fittingly, my first order at Pakta is a cocktail. It is, of course, a pisco sour, the quintessential tangy Peruvian drink—frothy with whipped egg white—but it comes augmented with the Japanese citrus yuzu. Dinner starts with a very Japanese honzen ryori, an arrangement of amuse-bouches on a wooden tray. Some of these are designed to be eaten with one’s hands, which also turns out to be the case throughout the dinner; my chopsticks get a workout on only one or two dishes. For the next hour and a half, I am bombarded with tiny dishes (the Machu-Picchu menu lists a terrifying 33 courses; luckily, all but a few require only one or two bites). The first, immediate hit is an intensely tangy soup made with clear fish stock and plenty of lime juice, with fresh peas and sprouts bobbing in the ceramic bowl. It is great, and the Pakta people know it; a bespectacled, ponytailed waiter named Fiorella García Rivas is on hand to offer a top-up from a kettle. I use the chance to get her to divulge a few of her favorite spots, too. She loves a burger place, of all things, named Kiosko. “The burgers are huge!” she says, and the contrast between this enthusiasm and the dainty food in front of me (and the equally dainty girl) is beguiling. This, I think, is the essence of the modern food world: I’m at a Japanese-Peruvian restaurant in Barcelona owned by the cocreator of El Bulli—and I’m talking burgers. As if to contradict him, next comes a volley of nigiri (though ají amarillo, a yellow chile, shows up to keep things from getting too Japanese) and the purely Peruvian causas, which are similar to bruschetta but with a potato base. Only two inches long, the fried causa with chicken and huacatay (similar to marigold, used in Peru as a spice) is packed with such concentrated essence of Peruvian flavor that it could represent the country in the UN. The mushroom tempura with potato foam and mushroom dust is an outlier: Served on a piney wreath of needles, it looks like something you’d get at Noma. The word foam in the context of an Adrià restaurant might quicken the heart rate of a molecular-gastronomy freak still mourning El Bulli, but the dish itself is simple, earthy and low-key. The hot entrées are misleadingly labeled TO FINISH. While the portions stay reasonably small, the presentations grow fanciful. Warm ceviche with rocoto (another, angrier chile) arrives with a glass of Peruvian beer, even though I didn’t ask for one. A chicken skewer sits atop a tiny, fully operational coal-burning grill the size of a coffee mug. Fried rockfish with Nikkei “escabeche” sauce is deboned but not split—instead, its back is elegantly turned out, forming a kind of fleur-de-lis. In lieu of a meat course comes the knockout punch of foie gras nigiri. Right before sliding into a foie gras coma, I manage to extract a couple of recommendations from Jorge Muñoz, the smiling, stocky head chef repping the Peruvian side of things. Not surprisingly, he talks up a place called Ceviche 103. As is the case with many great restaurants, the whimsy level at Pakta rises precariously with the move to desserts; it reaches the David Burke tier with the “black sesame and yogurt tree” (an actual tree, or a bough anyway, in a planter, with a single cookie stuck in a slit), but at this point, I am too ecstatic to nitpick. The “Mandarin tiradito” is a much better visual joke. It’s a fruit plate pretending to be a fish plate: Sliced rambutan resembles white fish, and frozen grapefruit vesicles are made to look like salmon tartare. Albert Adrià swings over to say goodbye before leaving for the rest of his rounds, but not before suggesting I check out his favorite (non-Adrià) restaurant, Granja M. Viader. My luck: It’s known for serving a great breakfast. It will make for tomorrow’s perfect starting point. I depart Pakta feeling pleasantly wiped out, yet somehow ready to tackle my new weekend eating itinerary. Once outside, I call a foodie friend who lives in town and rattle off the names of the places I’ve gathered. He hasn’t heard of half of them. Total success. Pakta, Carrer Lleida 5; pakta.es. Michael Idov is the editor-in-chief of GQ Russia.